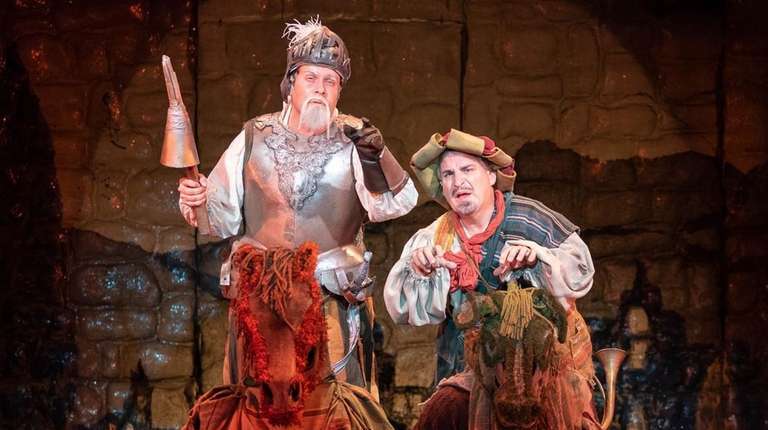 “Man of La Mancha” is one of those musicals you’d think audiences would be sick of seeing. Not so, says Richard Dolce, producing artistic director of the John W. Engeman Theater. In fact, he says the 1966 Tony-winning best musical is one of the shows they’re most frequently asked to bring back. So 10 years after its first run at the Northport theater, the musical inspired by Miguel de Cervantes’ classic 17th century novel “Don Quixote” is getting a return engagement, with a beautifully crafted, emotional production celebrating the enduring story of an idealist who holds fast to his dreams. If you’ve forgotten the story, here’s a quick brush up: Awaiting trial before the Spanish Inquisition, Cervantes and his manservant, charged with foreclosing on a monastery, are thrown into a dungeon with an unsavory bunch of thieves and murderers. Threatened, Cervantes devises a fantasy about a mad knight in search of lost chivalry, distracting his fellow prisoners by awarding them roles in his bit of make believe. Janet Dacal is gripping as Aldonza, the wild, lusty wench who in Quixote’s vision is a fine lady he calls Dulcinea (though in early scenes, her hair and makeup could use a little roughing up). Other fine performances come from Carlos Lopez as the devoted servant who becomes Sancho Panza, the squire always ready with a sarcastic quip; Bruce Winant, playing the innkeeper in the fantasy with sardonic wit, and Morgan Anita Wood and Phyllis L. March, as Quixote’s niece and housekeeper, respectively, who give the tongue-in-cheek “I’m Only Thinking of Him” a wry edge. This is a striking production, with the grim stone dungeon well rendered by Michael Bottari and Ronald Case — the actors dragging themselves in and out of the orchestra pit is an interesting touch. Adding to the overall effect are Kurt Alger’s appropriately ragged costumes and dramatic lighting by Alan C. Edwards — except for the occasional projections, which seem distracting and unnecessary. None of that really matters though. Judging from the audience reaction when Adams closed the first act with a moving “The Impossible Dream,” it’s almost certain the show will be back in another 10 years — if not sooner.